'Eyyyyyyyyyyyy. That's my greeting today in true Fonz style. Anyways, got some news and lots and lots of rumors to go through today so let's get right to it. We'll start with the Sunderland match yesterday, the last of the season, which we won 1-0 through a goal from Theo Walcott. It was a beautiful through ball from Gilberto that Walcott ran on to and finished easily. Mark Randall also had a goal but it was ruled out for offside. While it was by no means our best performance, it was good to finish the season with three straight wins especially while sitting some top players out. The pass from Gilberto really was wonderful and I have to tell you I hope he stays for next season. He's still got something to give even at this age and he does have experience and leadership that you need in a club. He spoke to Arsenal TV yesterday, saying his future will be sorted out soon. Let's cross our fingers and hope he stays. Theo Walcott has been putting in some great performances since he has gotten into the starting lineup and has been rewarded by being called up to Fabio Capello's England squad to face the United States. Arsene Wenger even revealed that he thinks Walcott can be a regular starter for Arsenal. I think he could be just what England needs, some pace and freshness and I hope they keep selecting him as well as Ashley Young, Agbonlahor, Lennon, etc if they want England to improve their teams instead of having the last few years of mediocrity. Hopefully Theo gets a run out in the match but obviously I'll be hoping for a US win. Robin van Persie says Arsenal will be back to getting silverware soon. He goes on to say that it will create a lasting memory in people's minds if we win trophies with the style of football we play. If van Persie could stay healthy next season it would definitely be a big boost for us as we have missed him for large portions of the last two seasons now. It's a shame he has to go play the Euro's this summer because I would much prefer him getting some rest. Let's just hope he can work out a better fitness plan and stay in the squad next year. Tomas Rosicky has said that he is going through "the worst time of his career." No, it's not another player wanting out of Arsenal, he's speaking about his injury. He has an operation tomorrow to try to see what is wrong with his hamstring and there is no timetable for his return at this point. The ligament has apparently separated from the bone and it's going to take a minimum of two months to recover from it but it could be more depending on what they have to do to repair it. You have to feel bad for the guy. He's had injury troubles since he got to Arsenal and if he could just put together a whole season of play I think he definitely has the quality to help us out. Get well soon Tomas. Lyon's Hatem Ben Arfa has said that he has spoken "about" Arsenal. He did not say he spoke to Arsenal, just about them. It was reported by many sites that we had signed Ben Arfa already but the deal is not done and it appears no contact specifically with Ben Arfa has been made by Arsenal. 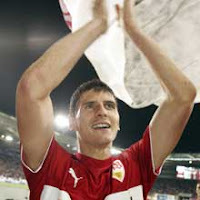 The new name today (there is a new one every day) is Mario Gomez of Stuttgart. Some in the media are now linking us with him because someone updated his Wikipedia page saying that he was moving to Arsenal for 20 million Euros. This has since been removed from his page and I find this story to be just a rumor. I don't see Wenger buying a striker as he said he wanted a defender and a creative player (midfielder by my estimation) and I don't think he would spend that kind of money on him either. Sky Sports has linked us with Jean II Makoun of Cameroon. Sorry I would have put his club team but it rhymed so that was too tempting. He plays for Lille and is a defensive midfielder that looks very good in my opinion. Can anyone tell me what his middle name is? Is it the number two or something? Ridiculous. Apparently Tottenham are also interested so they'll probably pay him 20 million just to go there or something. The article also says we could bid for Sevilla's Seydou Keita. I need your help! I've been trying to think of what to do for the end of the season and I have thought up a few ideas. Please let me know which one(s) sound good and I'll do it. 1. Player reviews - I thought it might be good to do a review of each player, one per day complete with stats and analysis going into the new season. I'd do pros and cons for each player, etc. 2. A Season review - Just a one time season review where I wrap everything up in one post, quick player grades, etc. Just let me know what you want to read and I'll do it. I want input to make this as good as it can possibly be! Also, if you read the site often, think about registering for the forums by clicking the link in the top right of the page. It'd be nice to get a community going on there that can talk Arsenal 24/7 between posts. And that's about all I've got today, I'm sure it'll be another day packed full of a bunch of nonsense and rumors tomorrow so you have that to look forward to. Cheers. Thanks so much for posting the Walcott goal, I was out of town so couldn't watch online or anything. Very pretty, better than I had imagined it from reading the match reports. I was pretty anti-Gilberto until about two weeks ago. You have a lot of good things to say about him, and it is seeming more and more like he'll be our only proven option for defensive midfield. So I guess I can deal with him staying. He just needs to stop giving away so many free kicks! GR8 post. i would like to see 1. and .3 it would be good to see some transfer news and a player profile. keep up the gd work. I'd be interested in seeing a breakdown of each player and what they contributed to the past season. I'm really wondering who might be the next Flamini...and by that mean someone to come out of no where and establishing himself as a starter on the team (but then doesn't leave of course in the following off-season). Based on how he finished the season Song might be on that list.